There are two new blog posts over at the Miraculous Agitations blog. ‘The Wire #364 – and Interestingnesses on the Art of Noises‘ gives a bit of background information to the Futurists’ Art of Noises in London, 1914. Two important sources are transcribed and downloadable. The Art of Noises centenary is a good cue to examine other bombastic and groundbreaking music hall antecedents, and this is found in the latest issue of The Wire magazine. 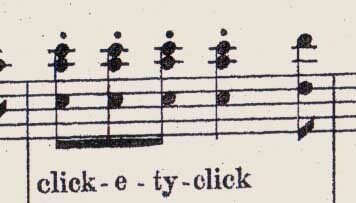 The second post follows up with some information on Clickety-Click (reperformed and hosted here by The Wire) – ‘Clickety-Click – The earliest surviving electrical musical score?‘. Clickety-Click was an early electro-musical score published circa 1887, unearthed during my research into acoustic novelties of that era. The recreation was carried out at Resonance 104.4FM by myself, Fari Bradley (piano), Chris Weaver (microphonics) and Toby Clarkson (photographics) – all members of Oscillatorial Binnage as it goes – one of our more unusual and educational productions! 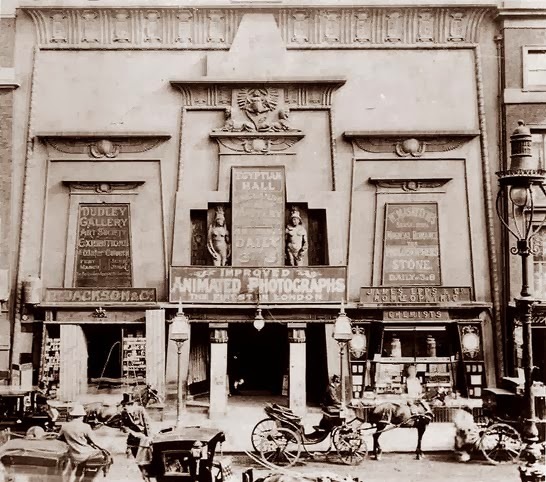 There are many obscure, under-explored sonic marvels to be found in the old music hall annals – I’m rustling to publish a detailed survey soon. In the meantime, the latest Leonardo Music Journal (#23) features my paper on ‘electrical music’ in Victorian music halls, focussing specifically on the work of the eccentric Johann Baptist Schalkenbach and his imitators. 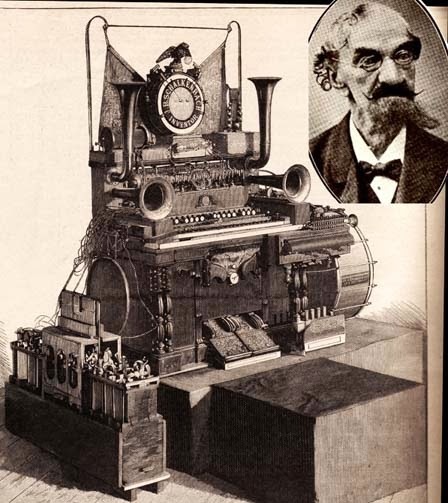 In the 1860s Schalkenbach developed an act in which he played on an amalgamation of instruments he called the Piano-Orchestre Électro-Moteur (built around a reed harmonium). Whilst playing, he would simultaneously trigger musical, noise and optical effects via the electromagnetic triggering of circuits connected to objects placed around the hall. It’s a delicate precursor to the noise machines of the Italian Futurists. Over the decades, the apparatus gradually became more spectacular as new features were added. Schalkenbach played upon the mysteriousness surrounding “electrical music”. One newspaper reporter presumed that the rain sounds were electrically produced: “in a moment even electricity travels to the roof of the building and also to the apparatus around the hall, and causes vibrations as if a thunderstorm were heard approaching from the distance; you hear the howling of the wind and the downfall of a torrent of rain.” Investigations reveal that, in reality, the electric action was only employed to control a door, releasing buckshot that rattled down concealed descending shafts (later to become a popular off-stage acoustic rain effect). But Schalkenbach’s instrument was nevertheless very sophisticated. In the 1890s, an electrical journal asked, “was it telephonically or phonographically that Herr J. B. Schalkenbach transmitted sounds to a distance?” It is unlikely that either of these techniques were employed. It appears to have been primarily electromagnetic triggering (including percussive sounds, motors, release mechanisms, explosives, detonations and light effects), the possibility of trembling-bell style feedback, and the basic wind bellows with their artful acoustic couplings through pipes and funnels. Although, there are still many mysteries. The descriptive, noisy, electrically actuated music pioneered by Schalkenbach was subsequently copied by many music hall acts, including Professor Beaumont (aka John Walmsley Beaumont) “Necromancer and Electric Musician”, Herr Renier, and most interestingly, H. F. Juleene (aka John Parsons) and Dot D’Alcorn (aka Susette D’Alcorn), a double act who titled their demonic centrepiece Mephisto. Dot D’Alcorn is possibly the first professional female performer of an electrical musical instrument. 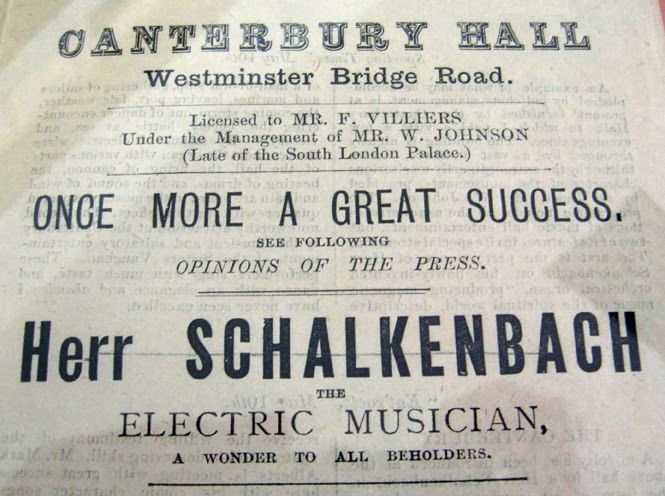 Juleene and Schalkenbach had an interesting run-in played out in the The Era stage newspaper involving aggressive placement of adverts. Schalkenbach and his ilk are particularly interesting in relation to the post-electronic music techniques outlined on this blog and elsewhere. In ‘post-electronics’, acoustic sounds are wrought with close adherence to classical electronic music techniques. Essentially: acoustics aspiring to electronic sound. In Schalkenbach’s art, acoustics likewise aspire (or are styled) to ‘electric’ sound despite the utter non-existence of any “electric music” listening paradigms at that time(!). Schalkenbach produces acoustic sounds – musical and non-musical – distant from the console, and presents them enigmatically as electrically produced sounds – sounds of mysterious provenance: the beginnings of sound art. 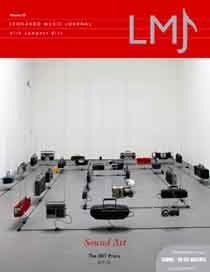 Leonardo Music Journal #23 is out now.